We're bringing the world's most elite tactical skills instructors to the general public so that you're average individual- the family man, the college student away from home, the homemaker- can learn to defend themselves should the worst occur. In other words, we want to make sure the good guys come home and the bad guys get their A** kicked. This combatives course was developed by USMC veteran and professional MMA coach Adam Lynn. While in the Marine Corps, Adam became certified as a MCMAP Instructor(Marine Corps Martial Arts Program), and was tasked with teaching some of the deadliest soldiers in the world close quarters/hand to hand combat. Adam is a Brazilian jiujitsu black belt, has been a pro MMA fighter, and has trained at the legendary Jackson/Winklejon Fight Gym- home of some of MMA’s most well known champions. Adam is now a professional MMA coach, and runs full fight camps at his Orange County gym SubFighter MMA. We tasked Adam with taking all of his combined experience and putting together a fundamental combatives training course for the general public. No death touches, no secret tricks, what, as a fighter, USMC veteran, and coach, do you think are the most important techniques for a person to learn to properly defend themselves in a real emergency. It’s just not about the moves though, it’s about the method. The student must learn how to apply each technique, and when they apply. That’s what separates combatives training. Students will learn timing, footwork, distancing. They will know what it is like to see a punch coming at them, to grapple with a resisting opponent. This is why we have high volume live simulation drills. Padded up students will use their techniques to fend off attackers (this will be done in a safe manner to protect all involve from injuries). We will be hitting pads and bags full speed and force, over and over again. 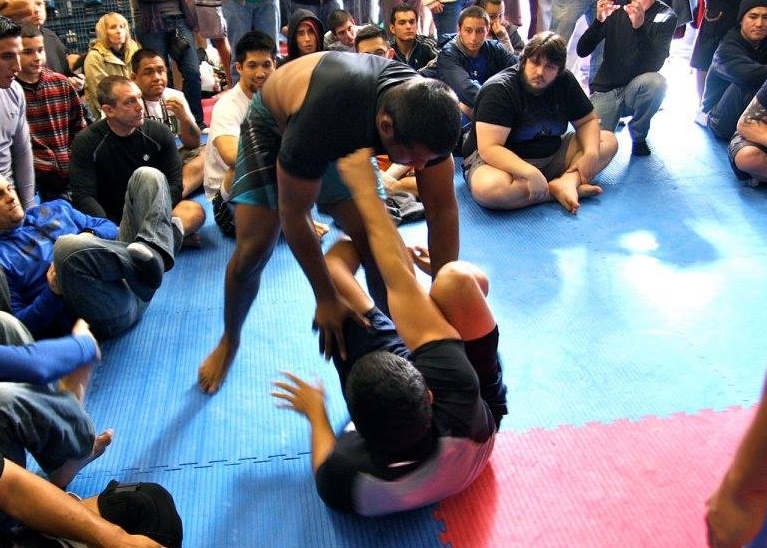 We will run grappling drills, over and over again. We will work hard to turn these moves into physical memory, into reflex, should the student ever need to use them. We want you to walk away will real self defense capability. This is why we drill the fundamental. After this training, because the student learns the methods behind the technique, and how to train them properly, they will be able to walk away and continue to practice what they’ve learned on their own time, with a full understanding of the application. You may attend Saturday only or the full weekend. Each day is split up into the fundamentals of striking, and the fundamentals of ground fighting.